This article tells you how to quickly make an excellent video at home with your own hands. At that, it doesn't matter how old you are, how computer-skilled you are and which software you've got installed on your hard drive. The only thing that matters is your wish! If you think that to make a stunning video of your birthday party or holiday or a business presentation you need a team of professionals, you are mistaken! The only thing you need for that is the free software for making slideshows. For example, Bolide Slideshow Creator. 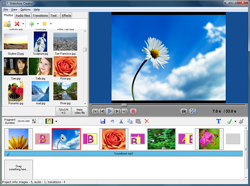 Using this software, you can make a home video in 7 easy steps. Step 1. Download Bolide Slideshow Creator and decide upon the event you want to make a video about. Even if you have no experience of making slideshows at all, it's not a problem. The program is so easy-to-use that from the very first moment you see what exactly you need to do and how to do it. You won't need any time to figure out how to add photos or anything. Just drag and drop your files. That's it! Step 2. Choose the photos of the event. Actually, choosing the right photos is not as easy as it may seem, especially if you've got hundreds of them. But making a good home video needs nice ones, most suitable, the best. By the way, the program works fine with all image formats. Step 3. Put the photos in the right order. Deciding upon the right order of the photos is what usually takes the most time. Because it matters – you need to prepare the whole story carefully. They shouldn't be put just chaotically. Quite the opposite, there should be a story behind the movie. Using the right order, you'll guide your viewers and let them follow the "path" you have prepared for them. Step 4. Choose the transition effects. There are loads of transition effects in the program – to find something suitable for your movie is no problem at all. In the program, you can either choose them yourself or have the program do it automatically. Step 5. Add your comments to the photos. In the process of making this video, you can add your comments and give the necessary details to the viewers. It's useful and helps to make a good movie. Step 6. Decide which music you need for your movie. You know that a good soundtrack is an essential part of any movie. So, you can't make a good slideshow without a beautiful soundtrack. Step 7. Enjoy the movie! Preview the video, make the necessary changes and make it a video in one of the popular formats. So, have fun making the video, enjoy your movie and impress your friends and relatives. Good luck!